One of the best parts of the summer is having the freedom to spend your days at the beach! Like most outings, a trip to the beach requires preparation to ensure your party’s safety. Knowledge of things like lifeguard locations, the meaning of warning flags and an understanding of sea pests will help you decide where and how to best spend the last days of summer. Here are a few tips to help keep your Florida beach trips as safe as can be! Pick a spot that is in close proximity to a lifeguard. Most drownings occur in unguarded areas. In addition to the potential for rescues, lifeguard stands can provide a point of reference when you are out in the ocean and are pushed down shore by the current. 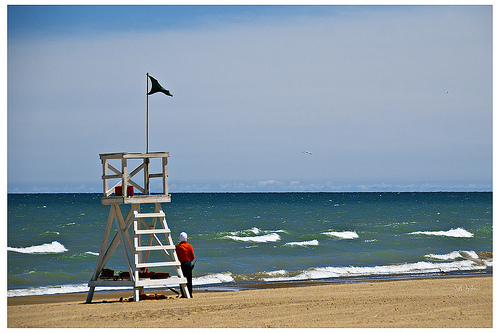 Lifeguards also have a wealth of information regarding the beach’s conditions and rules. The lifeguards on duty should be your go-to for any and all questions! Usually located at the entrance to a beach or at a lifeguard stand, warning flags are flown to indicate the conditions of the beach that day. Generally, red flags indicate strong surf, and currents and may indicate that the beach is closed. Yellow flags indicate moderate surf and currents: the water is likely to be rough but not exceedingly dangerous. Green flags indicate the ocean is calm or clear, and blue or purple flags often indicate that potentially dangerous marine life are in the area or have been spotted nearby. If you are unsure of the flags or conditions of the beach, find a lifeguard and ask to make sure- it’s always better to be safe than sorry! Rip currents are the number one risk to beachgoers and can pull even the strongest swimmers out to sea. Rip currents can happen at any beach with breaking waves and are generally found in areas where the waves break unevenly near a shallow point in the water, such as a sandbar, or close to jetties and piers. In addition to checking the conditions of your beach, survey the shore: if you see a current of choppy, off-colored water extending from the shore, steer clear. If you do get caught in a rip current, stay calm, save your energy, and keep breathing. Don’t swim against the current; wait until you’ve gained your composure and swim parallel to the shore until you’re out of the current. Once you’re out of the current, swim diagonally back to shore. If you feel like you cannot make it back to shore, signal help by waving your arms and making noise. Be aware of various marine life that has been spotted in the area. While shark attacks are rare, various sea pests like jellyfish, Portuguese Man-of-War and sealice are common along Florida shores. Once again, the lifeguard stand is the best place to find out what types of pests, if any, are at your beach that day. If you are stung by a pest with tentacles, like a jellyfish or Man-of-War, it’s important to remember to avoid rubbing any tentacles that may remain on your skin. Rubbing can activate stingers that have not yet released venom. Instead, scrape the tentacles from your skin with something flat, like a credit card. Then, deactivate the stingers: Rinsing with vinegar for at least 30 seconds works for some species, while a paste of baking soda and seawater works for stings caused by Portuguese Man-of-War and sea nettle jellyfish. Finally, relieve the pain by soaking the sting in hot water for at least 20 minutes. Despite common folklore, urinating on a jellyfish sting may cause stingers to release more venom, not provide relief.